Jordan Brand is set to add another impressive edition to their wide collection of lifestyle shoe this month and it is expected to be a hit despite its simplicity. 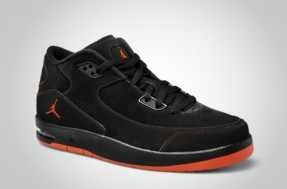 The Jordan After Game, which as the name suggest is usually worn after playing and for casual occasions as well, will be coming out in Black/Team Orange. The silhouette features a predominantly black upper part accented with Team Orange outsole, thread, and Jumpman and Jordan logo.